Judge Roy B. Dalton, Jr.
6:19-cv-00476-GAP-TBS ORDER denying  Motion to be admitted to the Court's bar instanter; denying without prejudice for failure to comply with Local Rule 3.01(g)  Motion for Extension of Time to Answer or respond.. Signed by Magistrate Judge Thomas B. 04/16/2019 Obando v. SBC Food Service, Inc.
04/12/2019 LLB Convenience & Gas, Inc. v. Southeast Petro Distributors, Inc.
04/10/2019 Clough v. McClure Construction Co, LLC. 6:18-cv-02069-CEM-GJK ORDER granting  Motion for Default Judgment; Adopting Report and Recommendations - re  Report and Recommendations. The Clerk is directed to enter a final Default Judgment in favor of Plaintiff and against Defendant for $4,404. 6:17-cv-02199-JA-DCI REPORT AND RECOMMENDATIONS re  Joint MOTION for miscellaneous relief, specifically Approval of Settlement and Motion to Dismiss The Case With Prejudice And Supporting Memorandum of Law filed by Brian Musser, Neff Rental, LLC. 6:18-cv-01364-PGB-TBS ORDER granting in part and denying in part  Motion to Strike  First American's Notice of Supplemental Authority. The Court also strikes, sua sponte, pages 4-5 of  Plaintiff's to strike. Signed by Magistrate Judge Thomas B. 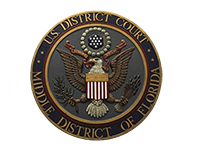 04/01/2019 Fleites v. Wal-Mart Stores East, L.P.
03/28/2019 Adacel, Inc. et al v. Adsync Technologies, Inc.
03/27/2019 Gorgone v. Florida Discount Drugs, Inc.
03/25/2019 Clough v. McClure Construction Co, LLC. 6:15-cv-02134-GAP-LRH ORDER adopting  REPORT AND RECOMMENDATIONS, granting  Unopposed MOTION for Attorney Fees Request for Authorization to Charge a Reasonable Fee filed by Sharika Nicole Jenkins. Signed by Judge Gregory A. Presnell on 3/25/2019. 03/20/2019 Gorgone v. Florida Discount Drugs, Inc.
03/19/2019 United States of America v. Net One International, Inc.
6:17-cv-01792-GAP-TBS ORDER granting in part and denying in part  Motion to Dismiss for Failure to State a Claim; denying  Motion to Dismiss for Failure to State a Claim. Defendants have TWENTY-ONE (21) DAYS to file an Answer to the Third Amended Complaint. 03/11/2019 Nail v. Government Employees Health Association, Inc.
03/04/2019 United States of America v. Net One International, Inc.
03/04/2019 Vazquez v. Strada Services Inc.
02/28/2019 Zabala v. Mattress Firm, Inc.
02/27/2019 Local Access, LLC v. Peerless Network, Inc.
02/26/2019 Zabala v. Mattress Firm, Inc.
6:17-cv-00072-CEM-TBS PERMANENT INJUNCTION entered . Signed by Magistrate Judge Thomas B. Smith on 2/25/2019. (Smith, Thomas) (Additional attachment(s) added on 2/25/2019: # (1) Exhibit A) (RMF). PERMANENT INJUNCTION entered . Signed by Magistrate Judge Thomas B. Smith on 2/25/2019. (Smith, Thomas) (Additional attachment(s) added on 2/25/2019: # (1) Exhibit A) (RMF). 02/23/2019 Woienski v. United Airlines, Inc.
02/22/2019 Medicomp, Inc. v. Abound Systems, LLC. 6:18-cv-01328-PGB-GJK REPORT AND RECOMMENDATIONS re  JOINT MOTION FOR APPROVAL OF SETTLEMENT, DISMISSAL OF THIS MATTER AND INCORPORATED MEMORANDUM OF LAW. It is RECOMMENDED that the Court enter an order as follows: 1. GRANTING the Motion (Doc. No. 31); and 2. 02/21/2019 Blacklock v. Kohls Department Stores, Inc.
02/21/2019 Ferguson v. East Coast Waffles, Inc.
02/21/2019 Gomez v. Acorn Stairlifts, Inc.
02/20/2019 Vazquez v. Strada Services Inc.
02/19/2019 Blacklock v. Kohls Department Stores, Inc.
02/08/2019 Pro Video Instruments, LLC v. Thor Fiber, Inc.
02/07/2019 Medicomp, Inc. v. Abound Systems, LLC. 02/05/2019 Whitson v. Bank of America, N.A. 02/05/2019 Obando v. SBC Food Service, Inc.
6:17-cv-01196-PGB-GJK ORDER adopting  REPORT AND RECOMMENDATIONS regarding Defendant's Motion for Sanctions and Dismissal (Doc. 56) filed September 24, 2018, and Defendant's Third Motion for Sanctions and Dismissal (Doc. 83) filed on December 7, 2018. 01/28/2019 Adacel, Inc. et al v. Adsync Technologies, Inc.
01/28/2019 Ortiz et al v. Metters Inc.
01/25/2019 Fiedler v. Wells Fargo N.A. 01/22/2019 Peterson et al v. PNC Bank, N.A. 01/18/2019 Gomez v. Acorn Stairlifts, Inc.
6:16-cv-01589-GAP-GJK ORDER adopting  REPORT AND RECOMMENDATIONS, granting in part  MOTION for Taxation of Costs filed by United States of America, sustaining  Objection to bill of costs. Signed by Judge Gregory A. Presnell on 1/10/2019. 6:17-cv-01587-PGB-GJK ORDER denying  Defendant's Motion for Reconsideration; resolving Defendant's Alternative Motion for Clarification as provided herein; and vacating the Court's January 7, 2019, Endorsed Order (Doc. 83). Signed by Judge Paul G.
12/27/2018 Doe v. Aetna Health Inc.
12/26/2018 Adorna v. Del-Air Heating, Air Conditioning & Refrigeration, Inc.
12/18/2018 Stevener v. Great Southern Water Treatment, Inc.
12/11/2018 Twin Rivers Engineering, Inc. v. Fieldpiece Instruments, Inc. et al. 12/07/2018 Price v. Orlando Health, Inc.
12/06/2018 Bell v. Freeman Decorating Services, Inc.
12/05/2018 Nash v. Bank of America, N.A. 12/04/2018 Nash v. Bank of America, N.A. 12/03/2018 Stevener v. Great Southern Water Treatment, Inc.
6:18-cv-00065-ACC-DCI REPORT AND RECOMMENDATIONS re  Joint MOTION for Settlement Approval and for Dismissal of the Action with Prejudice filed by Lachelle Jones, Quest Diagnostics Incorporated. Signed by Magistrate Judge Daniel C. Irick on 2018-11-29. 11/26/2018 Adacel, Inc. et al v. Adsync Technologies, Inc.
11/21/2018 Bell v. Freeman Decorating Services, Inc.
6:16-cv-01327-GAP-DCI REPORT AND RECOMMENDATIONS that  Motion for Attorney Fees be granted in part and denied in part . See document for details. Signed by Magistrate Judge Daniel C. Irick on 2018-11-13. (RN) Modified on 2018-11-15 (JET). (JET). 11/13/2018 Nash v. Bank of America, N.A. 11/08/2018 Cooley v. Real Property Specialists, Inc.
11/08/2018 McKennon v. Newscastic Inc.
11/07/2018 Morsch v. JP Morgan Chase Bank, N.A. 11/06/2018 Geysi Tsidhqiyah El v. US Secretary of State, et al. 11/02/2018 Local Access, LLC et al v. Peerless Network, Inc.
6:14-cv-00399-PGB-TBS ORDER adopting  REPORT AND RECOMMENDATIONS re  MOTION for Attorney Fees filed by Blitz Telecom Consulting, LLC, Local Access, LLC,  MOTION for Attorney Fees filed by Blitz Telecom Consulting, LLC, Local Access, LLC. 6:16-cv-00982-CEM-TBS ORDER granting  Unopposed Verified Third Application for Payment for Services Rendered; Adopting Report and Recommendations - re  Report and Recommendations. Fees in the amount of $44,590.00 and costs in the amount of $524. 10/26/2018 Nash v. Bank of America, N.A. 6:17-cv-02169-CEM-GJK ORDER adopting Report and Recommendations - re  Report and Recommendations. The final decision of the Commissioner is REVERSED pursuant to sentence four of 42 U.S.C. § 405(g) and REMANDED to the Commissioner for further proceedings. 10/23/2018 Schmitt v. Courtesy Professional Security, Inc.